TOTAL FLANKER...a rugby blog: Positional switch for Mathieu Bastareaud? I’ve long thought Mathieu Bastareaud too slow to command a place in the French backline and now it appears that former France outside half Thomas Castaignede agrees with me. 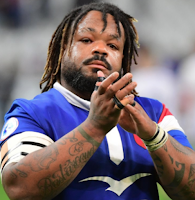 I’ve no doubt that Bastareaud could learn to play number 8, given time, but any suggestion that he could be good enough to play there at international level is, I suggest, fanciful and serves only to illustrate Castaignede’s knowledge of backrow play.